The Summer Solstice Celebration starts Friday, June 19 and continues through Sunday, June 21. In 2009, the Friends of Serpent Mound (FOSM) held a one-day festival that has since grew into three days of lectures, workshops, tours, and more. FOSM’s Summer Solstice Celebration – History, Mystery, & Intrigue, starts Friday, June 19 and continues through Sunday, June 21 at the Soaring Eagle Retreat, which is adjacent to Serpent Mound. Parking is available at Serpent Mound. FOSM encourages everyone to visit Serpent Mound before attending the festival. 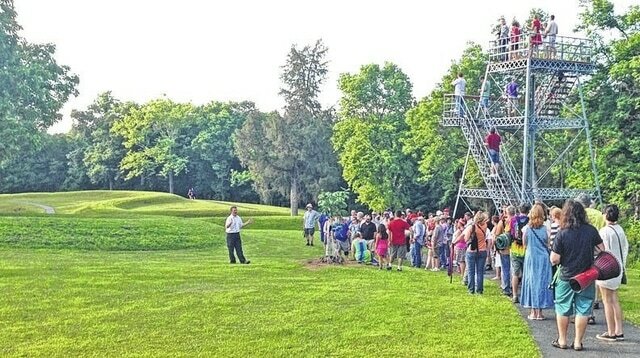 A complete schedule of the weekend’s activities is at www.serpentmound.org. There are three days of presentations scheduled through the afternoons and evenings. Presenters include regulars and locals: Douglas Ross Hamilton, E.P. (Ed) Grondine, Fletcher Wilson, Tammy Peach, Tom Johnson, Marilene Isaacs, Jeffrey Wilson, and Delsey Wilson. New presenters this year include: Richard Moats, David Tillis, Grandfather Clifford Mahooty, Joel Ayala Ayapana, Charmian Redwood, and Monnie Cummings. Singing and storytelling will be by Steve Free and Terri Rivera (Sings with Ravens), new this year Spirits of the Winds. Debbie Brubaker (Yellow Flicker), Joseph Whitefeather, and Chris Campbell (Freaky Frog Flutes) will be playing flutes. Over forty vendors have registered. Many have also agreed to do a workshop, a presentation, or a hike. Workshops from flute playing to crafts to energy work. Guided tours like a hike lead by Buckeye Trails, a car tour to the Serpent Mound Crater’s edge, and a guided hike through Serpent Mound. A complete schedule can be found at the FOSM website. Friends of Serpent Mound is a volunteer, non-profit organization, consisting of individuals from the local area and from many other places, near and far. The Summer Solstice Celebration is one of several events FOSM schedules throughout the year, at either Serpent Mound or Soaring Eagle Retreat. To learn more about the Friends group and their events, visit www.serpentmound.org or find them on Facebook, where they have both a page and a discussion group. The Ohio History Connection, formerly known as the Ohio Historical Society, owns Serpent Mound and contracts with the Arc of Appalachia (Highlands Nature Sanctuary, Inc.) to manage the day-to-day activities at Serpent Mound and at Fort Hill. Submitted by Friends of Serpent Mount.